On Wednesday October 17th, Fanshawe College in London, Ontario held the Awards Ceremony for the Faculties of Health, Community Studies & Public Safety. ULC is the sponsor of two Fire Inspection and Fire Safety Education Awards – an award recognizing great work of a Fire Inspection and Fire Safety Education student entering their third year. The criteria are academic excellence along with the demonstrated attributes of motivation and dedication to the profession, demonstrating enthusiasm, strong academic skills, and a strong team effort. The recipients were Michael Lindner and Marie Wachowiak. Both Michael and Marie successfully learned to balance work, school and personal commitments to excel in their program and look for opportunities to continue in the Fire safety profession. Brian McBain, ULC Senior Regulatory Services Rep, attended the award ceremony to recognize the two outstanding students and present the ULC scholarship awards. Fanshawe College currently runs the first and only Fire Inspection and Fire Safety Education program in Canada. 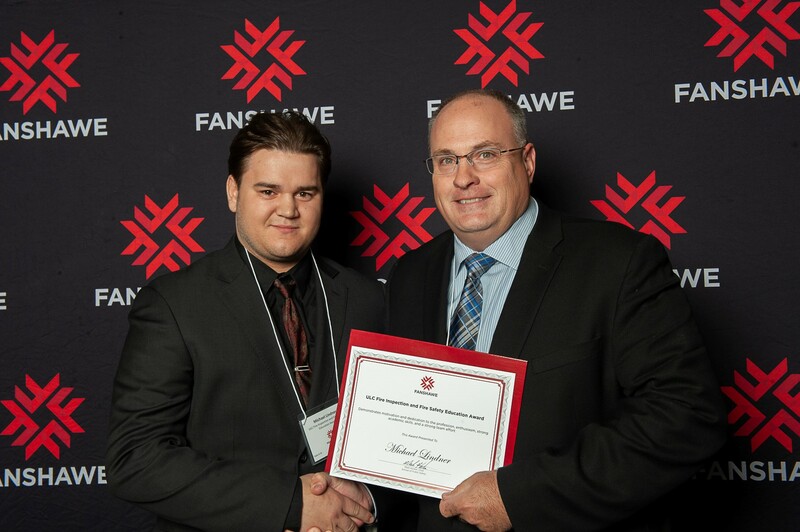 ULC continues to support fire safety education in Canada by providing scholarship awards to this unique program and delivering fire safety lectures at Fanshawe College.